The LifeDrive is the first product from palmOne's new mobile manager category of products. This new class of device is the first PDA released domestically to include a built in hard drive. It's aim is to be a repository for your digital content, be that photos, movies, music or large volumes of office documents. The LifeDrive takes the traditional PDA look with a modern minimalist look. It feels great to hold in hand. Even though it is palmOne's thickest model, the back is well beveled inwards for a nice comfortable hold. The front and back are a metallic brushed silver aluminum with a plastic middle section and bottom. The front buttons are a smooth rectangle around the racetrack shapped 5-way navigator. The navigator is one of the best I've come across as it's rubber material is very nice. Overall the LifeDrive has a superb industrial design, there is not a sharp edge on the unit. The top of the device houses the power switch/slider, which includes a new hold feature that will prevent button presses and screen taps from activating the device. Also in the black top section is the Ir window and the SD expansion slot. On the top right is the stylus silo. The LifeDrive uses the same spring loaded stylus as the Tungsten T3. On the top middle portion is the status LED. It pulses orange to indicate hard drive activity and green for WiFi use. It also lights up orange when the unit is off and plugged into the charger but does not change when fully charged. The LED can also blink for alarms. Unfortunately, there is no silent vibration alert. The left side contains two small holes for the microphone and the voice recorder activation button below. Just below is a dedicated screen rotation button, which switches the display from portrait and landscape. Both are flush enough that it's very unlikely they can be triggered by accident. The bottom contains a standard 3.5mm headphone jack, the multi-connector and a stylus tip pushable reset button. The back of the LifeDrive has a perforated air-hole design, with an embossed and raise square palmOne logo in the center. The unit has dimensions of 4.76" x 2.87" x .74" inches (120 x 73 x 19 mm) and weighs 6.8 ounces (193 grams). The LifeDrive Runs Palm OS Garnet (v5.4.8) on a 416 MHz Intel PXA270 XScale processor. It has built in 4 Gigabyte hard drive (3.85GB user available) and 64MB of internal memory (55MB user available). It has both WiFi and Bluetooth wireless technology and hotsyncing now supports USB 2.0 speeds. The LifeDrive utilizes a Hitachi 4GB microdrive. It is one inch, low power drive capable of a maximum sustained data rate of over 7MB/sec. palmOne chose this model because it has the best spin-up time and read/write speed on the market. The drive is partitioned so that 64MB acts like internal RAM and is called Program Memory. The remaining is shown, and acts like an external memory card, which is the 3.85GB user storage area. The program memory has all of the same characteristics of RAM and is structured similarly as the memory system on the Tungsten T5. However the program behaves a bit differently on the LifeDrive because it is hard drive based. There is 32MB of dedicated SDRAM that is used for the dynamic heap and is where apps are chached once executed. When an application such as Contacts is launched, it is copied over from the program memory to the cache. This process causes a short launching delay depending on the application and hard drive spin up. Some apps execute almost instantly while more robust apps can see up to a 5 second wait at maximum. Most of the built in apps open in under 3 seconds and the last five apps are stored in the SDRAM and will launch instantaneously when chached. It's not that bad of an inconvenience, but is a departure from what many are used to given the relative quickness of the Palm OS. The LifeDrive is powered by a 416 MHz Intel XScale a member of the PXA270 family of chips. This is just a incremental speed boost over the 400MHz T3. The PXA270 chip offers more multimedia support and some better power management features. Performance on the LifeDrive is fast, aside from the few HDD related issues. Large websites render quickly and many complex games such as Snails, ran very fluidly. The LifeDrive has a 16bit color, 480x320 pixel TFT screen, which measures 3.25" x 2.2" inches. It is the same improved display that debuted in the Tungsten E2. The display is 30% brighter and has 40% better color saturation than previous models. The display is very vibrant and holds up extremely well outdoors and in direct sunlight. There is an on-screen slider to adjust, but it does not turn off the backlight. The LifeDrive has both Bluetooth v1.1 and a WiFi (802.11b) wireless radio's built in. This is palmOne's first device with both and is a most welcome feature. WiFi signal strength and status is indicated in the bottom status bar. A tap on that will bring up the WiFi preferences which includes a network scanning tool and the ability to turn the radio on and off. You can also set how long the device keeps connections, preferred networks and configure the WEP or WPA wireless security. WiFi strength was on par, if not better than the Tungsten C handheld. Bluetooth can keep you connected on the road via a compatible mobile phone if you can't find a nearby WiFi hotspot for wireless internet access. With Bluetooth, you can dial out contacts from your address book, send and receive files, send sms and photos wirelessly, link upto a Bluetooth GPS, hotsync, and connect to the internet from a bluetooth mobile phone, computer or a bluetooth access point. The LifeDrive's top rear speaker is moderately loud and mp3's and sound effects are clear, though most will opt for using headphones (not included) for listening to audio. palmOne includes a version Normsoft's PocketTunes for mp3's. This is a much nicer player than RealPlayer and offers support for background play and on device playlists. I was disappointed to discover the LifeDrive still uses the same old fashioned pilot 1000 alarm sounds for the calendar. One problem I had was with listening to mp3's in the background. Anytime I switched to another application or the device read from the hard drive would cause the music (being played from the HDD) to be interrupted by short, yet annoying, pauses and clicks. This only happened with files on the HDD and not files on an SD card. It sounds like the drive may have some issues with multitasking and listening to music off the hard drive. The LifeDrive has the new palmOne standard Multi-Connector for hotsyncing and DriveMode functions. It has been upgraded to support much faster USB 2.0 speeds which greatly enhance hotsyncing speed and allow for quick transfers of large files to the hard drive. Transferring a 30MB mp3 over Drive Mode, took just under 20 seconds. Unfortunately, the LifeDrive does not ship with a cradle. Instead it comes with a USB cable and a separate AC charger, that can plug directly into the handheld or into the dual USB cable connector. The supplied USB cable has a button on the connector that can be used to initiate a hotsync. The USB cable alone will not charge the handheld from the computer, you must attach the AC cord. The LifeDrive has a non removable 1660 mAh rechargeable lithium ion battery. The same that is found in the Treo 650. Battery life is going to vary very significantly with how you use the device. With all the built in features, your usage pattern is going to determine how much you can get out of a charge. For my general reviewing purposes, I was able to get about 4 and a half hours out of a full charge. This included moderate web surfing over WiFi, lots of Bejeweled 2, using the PIM applications and listening to a few track's from the HDD. palmOne's official numbers are with 45 minutes of use per day, one would get about 2-2.5 days of use. Because the HDD does not need a charge to store your data you will not loose memory content's when the power is empty and the device has a longer keep alive time. The LifeDrive features palmOne's most impressive software bundle to date. Out the box on the device is: the enhanced PIM suite (Contacts, Calendar, Notepad, Memopad and Tasks), Media, Pocket Tunes, Blazer, Versamail, Camera Companion, Drive Mode, Phone Dialer, Doc's to Go, Addit, SMS, Handmark Solitaire, Voice Memo, Files, Calculator, World Clock, Expense and Favorites. On the CD is: Adobe Acrobat Reader, WiFile, a trial version of Handmark Express and eReader. palmOne touts the LifeDrive as a mobile manager and has built up an application suite to make managing large amounts of digital content easy. On the device this includes the Files application for viewing your files and folders. It is a basic on device files and folder navigator for the HDD and SD cards. You can open/rename/copy/send/delete or move files and create folders. You can also select which program to open a file with, baring the program supports the files application. Also on the handheld is Drive Mode, which with the included USB cable, mounts the LifeDrive's storage space as a removable drive on your PC or Mac for direct file management. Folder Sync, for windows computers only, can be setup to automatically update selected files or folders of files when hotsyncing. This can be local folders or even network drives. You can simply drag entire folders of data and the folder organization will remain intact. LifeDrive Manager on the PC, provides a live windows explorer like view into your Hard Drive and SD cards. It also lets you drag and drop files from your PC, but additionally gives you the option to sync, format for the device or just copy to the LifeDrive. 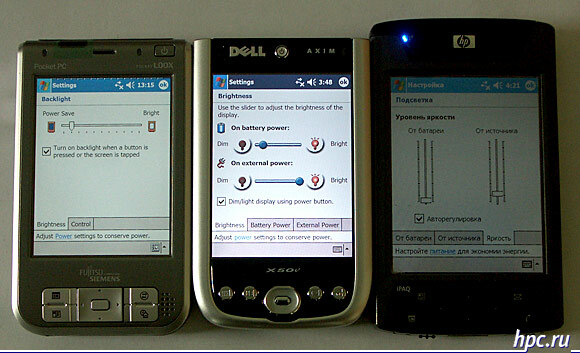 palmOne bundles the latest v7 release of Dataviz's Documents to Go on the device. Docs to Go supports creating and editing native Microsoft Word, Excel and Powerpoint files. You can use files received from email, Bluetooth, stored on SD or beamed to the device. Another new program to the LifeDrive is camera companion. When a SD card from a digital camera is inserted the program will automatically detect it and ask you what you want to do. You can copy the entire card to the LifeDrive, copy them to the Computer, or view them on the device without copying. It's a good application for taking a large amount of pictures with a camera and then dumping them down to the LD allowing you to wipe the card and continue shooting. This is a nice "leave the laptop behind" feature. palmOne's media application has been greatly speed up to display photo thumbnails, even from large megapixel camera's. It is still a weak movie player as it does not support many compressed codec's such as Divx and Xvid. It's best to use MMPlayer or the TCPMP player for a much improved video viewing experience, but it does work well for short clips and movie trailers. With VersaMail's support for POP and IMAP email servers, users can download mail wirelessly or by synchronizing with their desktops. For Enterprise users whose organizations run Microsoft Exchange Server 2003, the program has built in Exchange Server ActiveSync that will directly import and enable corporate email and calendar synchronization. One the desktop side of things, palmOne includes their Quick Install program for Windows. Quick Install simplifies installing programs and converting documents and photos for handheld use. Users simply drag zip files, prc application files, photos, videos and even MS office files into the app and it will preform the necessary conversion and install the the files on the next hotsync. The software CD includes the Palm Desktop for windows and Mac as well as the palmOne Outlook Conduit. palmOne new flagship handheld is a handsome PDA. It is loaded with features and has massive amounts of storage to spare making it an exceptional portable media solution with a huge base of applications to choose from. With the addition of the hard drive and dual wireless, this model may be the best laptop replacement PDA's out there. The LifeDrive mobile manager from palmOne has an estimated U.S. street price of $499. Limited quantities are available now from the palmOne online store and select retail stores worldwide. Volume availability is expected by early June. You can also search for the lowest price on our PriceGrabber service.